Bluegrass doesn’t get any better than Laurie Lewis & the Right Hands. She’s won the International Bluegrass Music Association award for Female Vocalist of the Year multiple times, not to mention a Grammy for her contribution to True Life Blues: The Songs of Bill Monroe, and her Right Hands are about as talented as a band has a right to be. Laurie sings and plays guitar and fiddle. 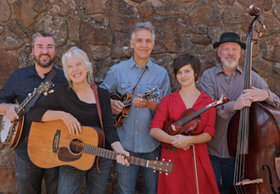 Tom Rozum sings, swaps jokes, and plays mandolin, mandola, and guitar, Tatiana Hargreaves plays fiddle, Patrick Sauber plays banjo, and Grammy-winner Todd Phillips plays bass. If you’ve never heard them before, you need to hear them as soon as you can. And if you’ve already heard them, chances are you want to hear them again. Laurie Lewis - songwriter, fiddler, vocalist, teacher, producer - almost quit music altogether the year she graduated early from Berkeley High School and moved out of the house. Her father, an accomplished classical flute player, encouraged all of his kids to take up instruments. But after “a botched run-in with the piano” at age seven, and five or six years of classical violin lessons starting at twelve, Laurie was ready to move on to something new, something that wouldn’t ask her to read a key signature. And while for the moment that meant putting down the violin and moving on from music altogether, it would turn out that she had already found what she was looking for, and it was just down the street every summer on the UC Berkeley campus.